The National Conference on Information Technology Education (NCITE) provides a venue to present innovative ideas, approaches, developments and results of research projects in the areas of Information Technology and Technology-based Education. The conference also promotes the exchange of information between researchers, faculty, administrators, and I.T. practitioners. 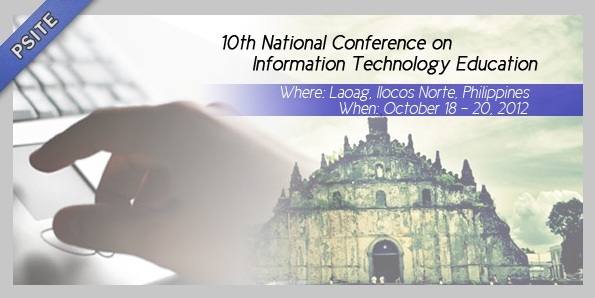 NCITE 2008 is organized by the Philippine Society of I.T. Educators Incorporated (PSITE, Inc.) in cooperation with the University of the Philippines - Los Baños and PSITE Region IV Chapter. Authors are invited to submit original, unpublished full research papers for presentation at NCITE 2008. The Conference Review Policy requires that each submitted paper will be peer-reviewed by at least two reviewers for inclusion in the conference program and CD-ROM proceedings. A review of all papers is undertaken by the members of the Paper Review Committee to determine the outstanding paper award. One author per paper is required to register and attend the conference to present the paper if accepted. The full papers are due by September 14, 2008. Authors of accepted papers will be notified by September 29, 2008 via e-mail. Final version of the paper and presentation slides will be due by October 6, 2008. All manuscripts and slides must be submitted electronically, in PDF format and formatted using the ACM templates available at http://www.acm/. org/sigs/ pubs/proceed/ template. html. A maximum of fifteen pages, including an abstract of up to 200 words will be allowed for each accepted paper in the proceeding. Email your manuscripts and slides (in PDF) to ncite2008@gmail. com. Authors will be responsible for their travel and living expenses. The conference CD-ROM will contain the full paper and slides of all research papers presented and will be distributed free-of-charge to all conference participants. CONTACT INFORMATIONPlease direct questions regarding research papers to ncite2008@gmail. com. CONFERENCE FEE: The conference fee for walk-in participants is P2,750.00 for PSITE members and P3,000.00 for non-PSITE members. This covers food and materials. 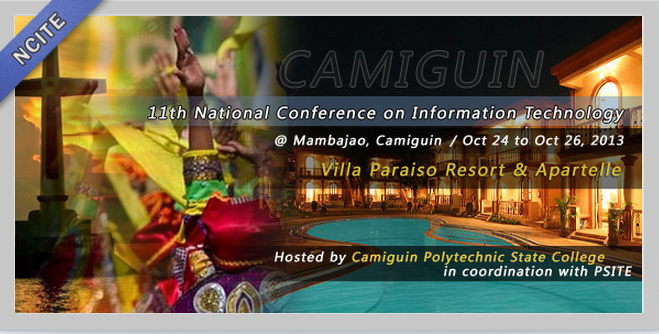 A discounted rate is given to participants who register on or before October 3, 2008. The early bird rate is P2,500.00 for PSITE members and P2,750.00 for non-PSITE members. An additional fee of P1000.00 will be charged to those who will avail of UPLB Hotel accomodations. Be advised that there is only a limited number of rooms at the UPLB hotel and early reservation is recommended.